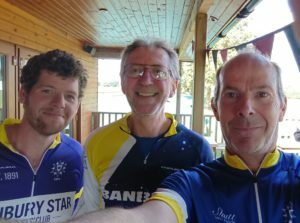 Three Banbury Star riders entered the annual Bidlake CC Hilly time trial on Sunday, an open event held on a 36 mile challenging circular course based at Charlbury in West Oxfordshire and taking in some of the most scenic parts of the Cotswolds. The event is held to honour the legacy of Frederick Thomas Bidlake, the father of time trialling, who was not only a timekeeper of cycling, but also of motorcycling and seaplanes in the 1930s. Held in bright conditions but hampered by a blustery wind, the course comprised of two laps of an 18 mile circuit, with plenty of grinding climbs and some rapid descents. The winner was Chris Bartley, who set a new course record time of 1.20.07. Times for the three Star riders were, club race secretary Mike Hicks 1.47.55, Geoff Hewett 1.48.35 and Sam Wootton 1.58.50, which earned them the Team Prize. Additionally, Geoff won the 60-69 year old age category.